I love theatre. I adore theatre. It's breathing to me. I've gone from an often-unemployed-but-professional actress to "employed -yay" theatre teacher to "employed - yay" director to "freelance but produced - yay" playwright. I love figuring out the lights, playing with sound, agonizing between words and creating characters. Except when I don't love it and then I start to wax poetical about every other profession in the world (except maybe Toll Booth Operator). I love blogging. Adore it. Except for those times when there is no time and I think I should be getting something up - only I have nothing to say and last week's cooking was not inspired and I don't want a cookbook deal and the days have been dark and I'm just going to use the stupid flash - ....and I'm trying to understand physics for a play I never should have decided to write ... so I haven't visited anyone....and then ... I just sit and read blogs. And in no time, I'm back to loving blogging. It's the community. Sometimes you share a story and I nod. Then, you unveil a recipe and I'm bewitched. You awaken a sense memory in me and I need to follow that road. And you do unexpected generous things that don't call attention to yourself - you just do it. 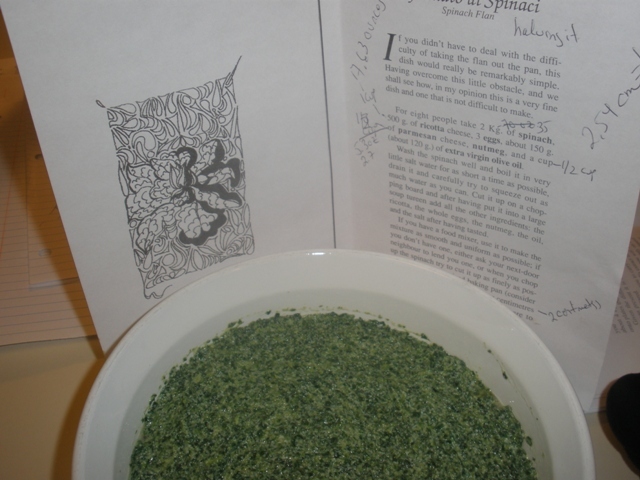 An example of your generosity and kindness is this recipe - that came to me through a blogger. If you don't yet know Ciao Chow Linda I beg you to go over there. Make it a New Year's resolution - because this one you will keep!And get ready to cook (and smile). In November I wrote about a ricotta sformato I had made - inspired by the restaurant Il Cibreo in Florence. Ciao Chow Linda asked me if I had picked up their little cookbook and I replied, "Sadly no and I regret it." "If you didn't have to deal with the difficulty of taking the flan out of the pan, this dish would be remarkably simple. Having overcome this little obstacle, and we shall see how, in my opinion this is a very fine dish and one that is not difficult to make." Having been forewarned about taking it out of the pan (it is indeed a mass of softness), I thought about doing these in individual ramekins but I wanted to see the texture. Next time I will do the ramekins. But I don't regret doing it in one pan. I'm a sucker for turning vegetables into whispers. 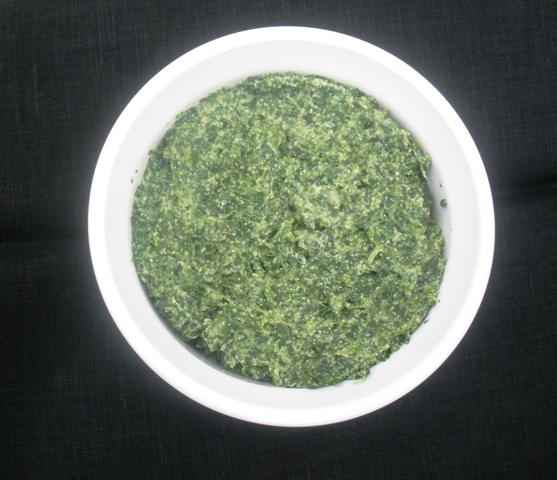 "If you have a food mixer, use it to make the mixture as smooth and uniform as possible; if you don't have one - either ask your next-door neighbor to lend you one, or when you chop up the spinach try to chop it up as finely as possible." Put it in a medium sized baking bowl. The flan should be about four centimeters thick (mine was smaller and 2.54 centimeters equals 1 inch). Spread the mixture taking care to smooth the surface. Put the pan in the oven at 150 degrees C (about 300 degrees F) and leave it for a few minutes - just enough time for a thin film to form on the surface. (I only got a partial film.) Remove from oven, cover with tin foil and then you will need to check from time to time to see if the mixture is starting to swell (yes, Chef Picchio says you can open the oven - no problem - it's not a souffle).At that point, cover it well again and turn the oven down to 100 degrees C (about 212 F - and 215 F is just fine) and leave it for about 40 minutes. To serve: Cut the flan into rectangular pieces (as you can see my shape didn't hold) and serve (preferably on heated plates) with tomato sauce or with a little melted butter and a dusting of Parmesan. I did the latter. "I would advise you to carry out all the operations in the kitchen. To extract these rectangles without breaking them you will need to use rectangular spatulas: press lightly on two opposite sides, ease the pieces out and deposit them on the plates. If you need to use a finger to salvage a situation verging on disastrous, this will be understood, forgiven and justified even by the Hague Tribunal." So there you have it - my flan - spread. The family didn't even look at the shape-shifter. They just ate. And sighed. Sighs tell a lot. I thank you for all your kindnesses during the previous year. And I thank you for your blogs - your artistry and your nourishment. Food is necessary. Sharing elevates it. We are programmed to eat. We are also programmed to create. It's all somewhere in our DNA which is why we are a community. Buon Anno, friends. May 2012 bring you joy. And when it does - note it: in your blog, on a post-it-note attached to your computer or jotted down on the calendar. So no matter where you are on a given day - you have knowledge of the joy. I brought home four tea-lite globes to place by everyone's supper plate in the dark December eves. I had the best of intentions - wishing to bring holiday cheer to the table.Then, Kirsten brought me two more bird globes from the Sprawl. They're sweet little baubles. 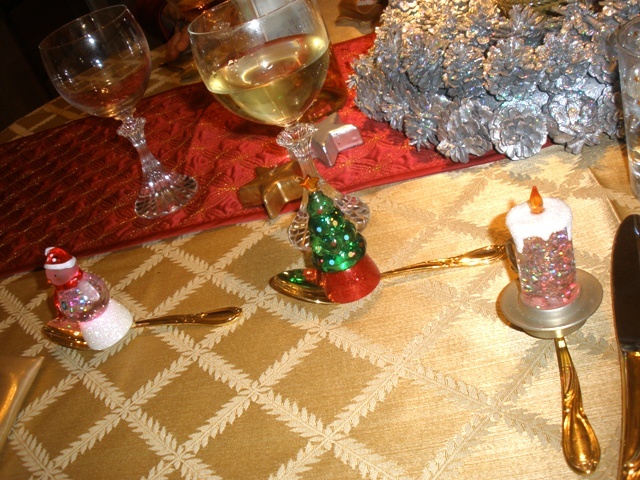 Innocent Christmas tchotchkes. Or so I thought. 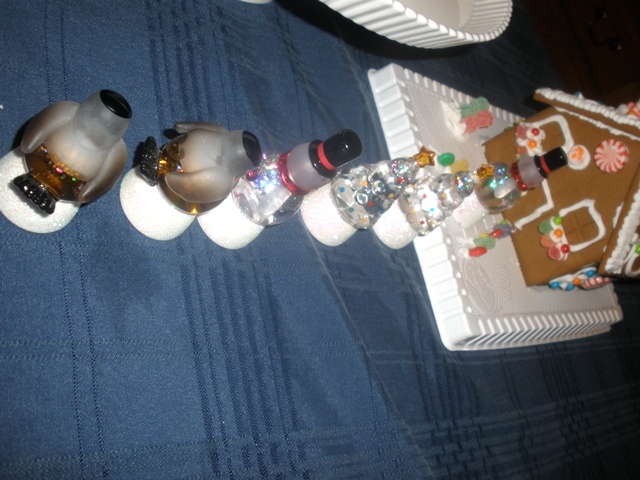 They light up, turn different colors, shower glittery snow and cast spells. Shortly after that, my family started watching the globes. Forgetting to eat. And cheering when the globes were "in synch" (all displaying the same color at the same time). Harmless, right? This developed into everyone grabbing the globes at some inopportune time (when I was eating) and we all had to turn them on at the count of "three" to synchronize their colors. (They never did stay in synch.) 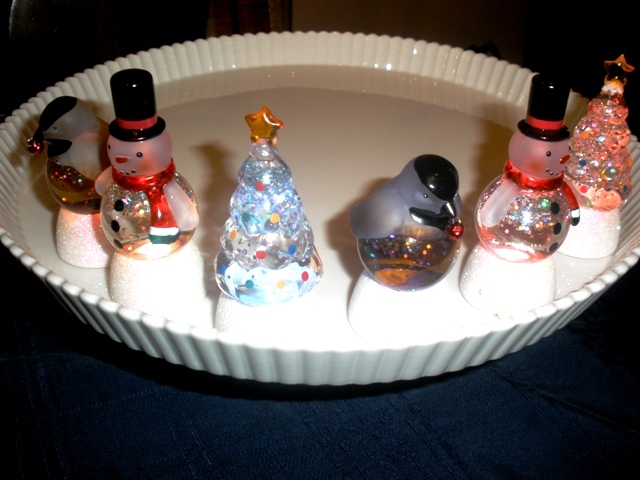 Then, they had the nerve to accuse me of always having a snow globe changing color one beat after all the others. Then... my husband started displaying unusual behavior. He started going to the dinner table early and corralling all the little globes around his plate. 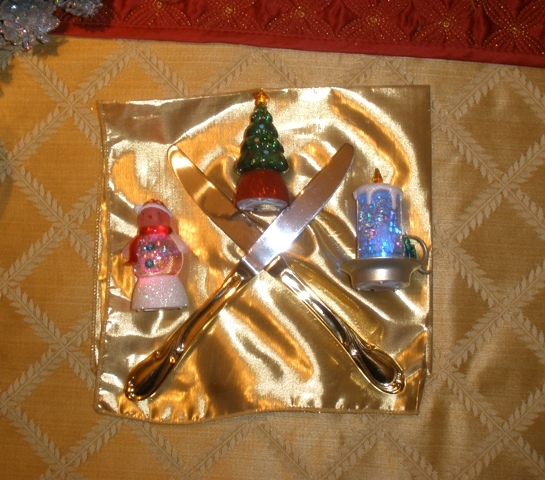 He shook them until the glittery light threw sparkles that danced on his plate and announced that clearly he was the most celebratory one in the family. The gauntlet was thrown down. The competition began. 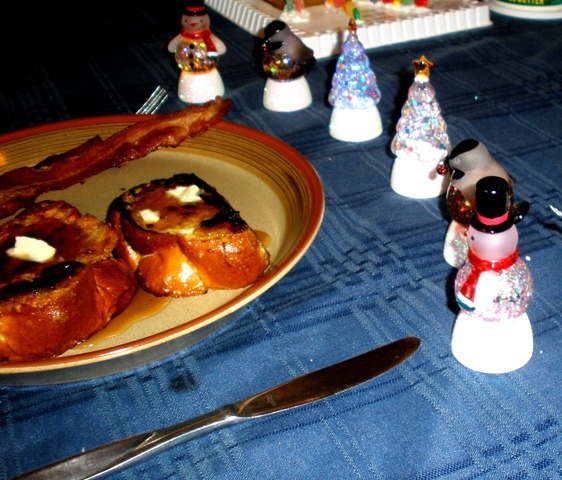 By Christmas morning, the innocent little globes were being used as pawns as they were stolen to circle one plate and then another. If you reached across the table to grab a pat of butter - Boom! - your snow globe was stolen. And placed in a spoon, on the butter, hobbling precariously on a bottle or just selfishly hoarded. Or lining up to get inside the house. The tea-lite-globes at my mother's home were greeted with joy. My poor mother and sister had no idea what mischief could ensue at the dinner table. Soon the tea-globes were perched on spoons. And were part of a Coat of Arms display. And of course graced a dessert tray. And when 3-year-old Adam patiently explained to me that Santa might not make it to my home on Christmas Eve - because we were all grown-ups - I was sure that Santa knew better. Unfortunately, making mischief with tea-lite-snow-globes does not burn a lot of calories. And so we are in Day 2 of Christmas Recovery. I saw this on the Food 52 Digest website. It reminded me of one of the endless variations of of the Italian Aquacotta (cooked water) without the eggs. It is basically a "cooked vegetable in water" soup - perfect for the calm before the next holiday storm that is on its way Saturday night. I jazzed it up with shallots and garlic - but it does have a purity that entices during the Season of Indulgence. Over low heat, warm the olive oil in a large, heavy-bottomed pan. Sweat the onions (and shallots) in it for fifteen minutes. Don't let them brown. If using, add the garlic during the last minute. Add the cauliflower, salt to taste and 1/2 cup water. Raise the heat slightly, cover and cook for about 15 minutes - until tender. Then add 4-1/2 cups water, bring to a simmer and cook an additional 20 minutes uncovered. Working in batches puree the soup in a blender. (I used an immersion blender - saves time and clean-up). Let stand for 20 minutes. It will thicken a bit. Thin the soup with last 1/2 cup of hot water. (Adjust the amount of water to your liking.) Reheat. 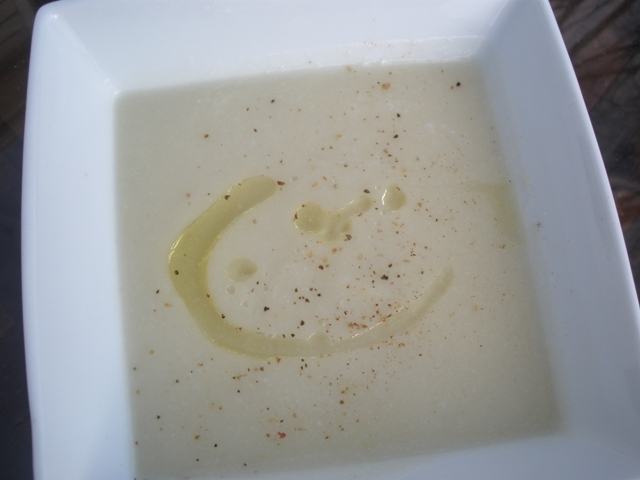 To serve: ladle soup into bowls and drizzle about 1 tablespoon of olive oil over it. Add a little pepper and enjoy. It's as white as the new-fallen snow that we don't have... yet. (Do you hear me chortling with joy?) And watch out, I will be visiting all of you for the New Year wishing you all good things.... but if you have a mini-tea-lite-snow-globe, the unexpected just may happen. 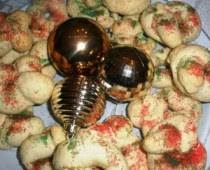 An Italian Cookie Christmas... Pine nuts, almond paste and citrus make these 3 cookies very Sicilian. The ingredients are so sunny and bright with flavor, they shake up winter. I did consider doing a post using grapefruit, cottage cheese and raw carrots. It is possible that your eyes may glaze over if you see one more preparation that includes "cream butter and sugar and add eggs mixing well." 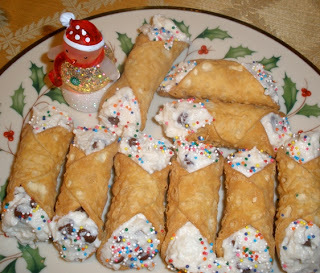 But 'tis the season of sweets and during the holidays Italians pull out all the stops. If we're putting together a Cassata, we're contemplating the wisdom of adding panforte to our to-do list. Then there's Ciao Chow Linda's boozy Baba Au Rhum or Proud Italian Cook's Limoncello Tiramsu or What's Cookin' Italian Style's Lemon Polenta Biscotti. You see the dilemma - Italians typically only do sweets on special occasions. But when they do - they do it right. I'm surprised there isn't a Feast of the Seven Dolci! Even if you're "cookied-out," note these sweets for 2012. 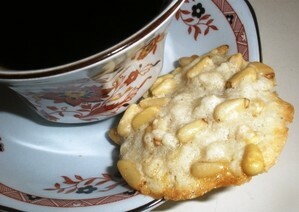 The pignoli cookies are classic - delicate almond-flavored puffs studded with pine nuts. 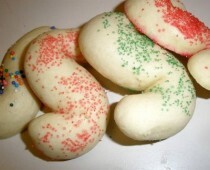 The Italian knot cookies are soft, pliable, citrus billows often seen at weddings. 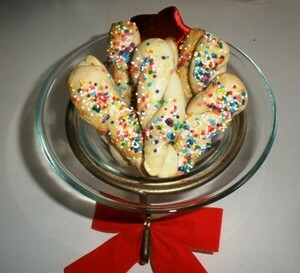 And the "S" cookies made with olive oil instead of butter pair very well with Prosecco! Which is my best ringing endorsement for that Sicilian cookie. For fun: You might also want to try Mister Meatball's "Best Pignoli Cookie"
Preheat oven to 325 degrees F. Grease baking sheet very well (even better, grease both sides of parchment paper and put it on baking sheet. These cookies bake better if there are no edges on your baking sheet. Cream your almond paste and granulated sugar. Add the confectioners sugar and 2 egg whites and beat until smooth. The dough will be wet and sticky. You can refrigerate to make it a bit easier to work with - I grease my hands. In a small bowl, beat the last egg white. Pour pignoli nuts in another bowl. Grease your hands and pinch off 1 inch of dough (can pinch off larger for fewer cookies). Roll into a lumpy ball and then roll in beaten egg white and then in the pignoli nuts. Place on cookie sheet - two inches apart. They will spread! For the small 1-inch balls - bake about 12-15 minutes. Larger ones may need a few more minutes. Watch carefully that they do not brown. This are not a crispy cookie - they should be soft and chewy. Cool on wire rack. These are the fussiest of the recipes. 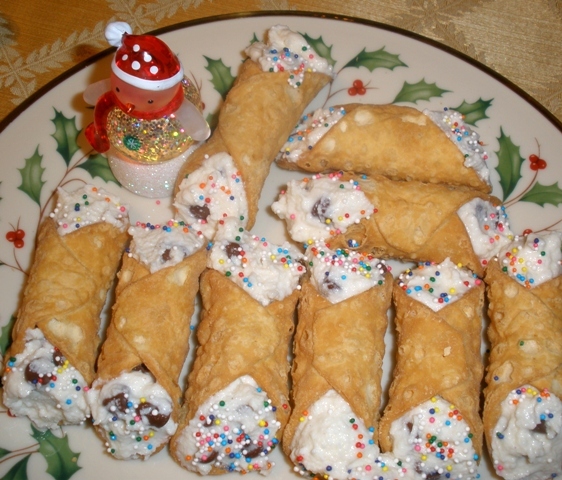 But if you sit down and have them with a cup of coffee or an amaretto, they truly are a taste of Italy. Preheat oven to 350 degrees F. Grease your cooking sheets. In a medium bowl, sift (I don't sift) your flour, baking powder and salt. In a large bowl, beat your olive oil and sugar until a bit fluffy. Add your eggs one at a time, beating well after each addition. Add your extracts and beat for 45-60 seconds. Add in your flour - about 1/4 at a time and mix well after each addition. Guess what? The dough will be sticky! Flour your hands and pinch off about an inch. Form into a ball, then a log and then turn your log into an "S." Put on cookie sheet. Repeat - placing your S-dough 2-3 inches apart. If using sprinkles, sprinkle now! Bake for 8-10 minutes. (You also don't want these to brown.) Cool for 1 minute in pan and then transfer to wire rack. 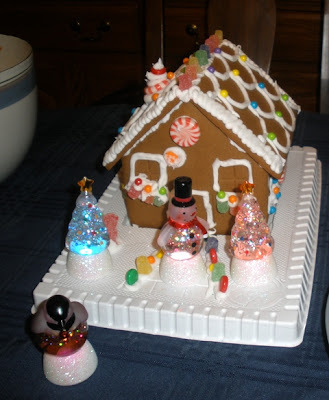 If using, brush with icing. Let cool completely and store in airtight containers. These do keep well - at least a week - but they never last longer than 48 hours here (and I hide them!). The orange scent while baking is a walk is a heavenly bonus. 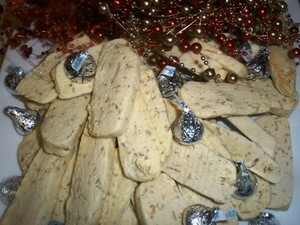 As with the "S" cookies - simply sprinkle with sugar before baking or add confectioner's icing after baking. Or leave plain and have them for breakfast. Preheat oven to 350 degrees F. Grease 2 baking pans. Combine flour, baking powder, baking soda and salt in a medium bowl. In a large bowl, cream butter and sugar and mix well. Add eggs, one at a time, mixing well after each addition. Add the zest and juice and briefly mix. Add the flour in 3 additions and mix well. If dough is too sticky, refrigerate for an hour (mine wasn't). Pinch off a two-inch piece of dough. Form into a ball and then a log - about 8 inches long and form into a lose knot or simply cross the ends. Space them about 2 inches apart on the baking sheets. Bake for 15 minutes (just until the edges look like they are browning). Can cool in pan. But I cool on a wire rack after a few minutes. 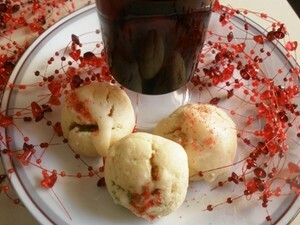 And an oldie-but-goodie from last year - Ricotta Cookies - creamy, snowy-sweet. Find them here. And Orange Whiskey Cookies. Also find them here. If you're in the kitchen a lot consider listening to Holiday Spectacular form This American Life. (It came to me from Brian Ferry's blog The Blue Hour and if you don't know it - you should.) Your baking time will fly by and I am sure everything I baked tasted better because the cookie dough also listened to the stories. I will be stopping by all of you to wish you soft lights in the solstice, Buon Natale, Merry Christmas, Happy Chanukkah and for the politically-correct among us, you may like the University of Minnesota's mandatory greeting "Happy Winter Celebration." I am going to digress for just a moment with the post regarding Anne-Sophie Pic. It's coming. My mind is fluttering. There are things you think about when you first have a child. "Will they talk?" comes to mind. And of course they do - and they not only talk - they have opinions. And they belong to themselves. And it's a wonder. A day may come when you're sitting at a concert and your daughter is performing a flute solo and your mind races through time - to the curly-afro child who never let you comb her hair (she has since embraced the world of hair straighteners) - to the 5 year-old climbing on high kitchen cabinets to snare a cookie when she thought her mother wasn't looking - to her 13-year old rebellion when she refused to bring home the "red folder" from middle school because she didn't need a stupid folder to bring her parents school notices. She could do it just fine. She wasn't a child! But she was and now she isn't. Well, she is when she goes out at night to search for pre-made cookie dough because her mother hasn't supplied her with cookies - and it's finals week. But she isn't when she is a college graduate. And she is. And she worked for it. The little girl who brought home stellar report cards with the only admonishment "Quiet. Could participate more" is on her journey to be an audiologist and work with the deaf - specifically young children. There's a smile here - my quiet school girl working to open up a noisy world for others. And another smile - because she can still be goofy. I think "being goofy" is a necessary life skill. 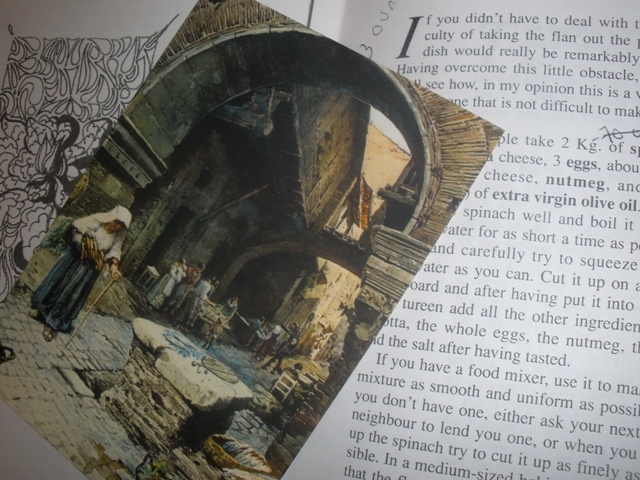 And now we segue from musings to today's planned post - tomato chutney by Anne-Sophie Pic. This isn't my best transition into a new scene! Thank goodness this is a blog and not a play. Anne-Sophie Pic is to the kitchen born in the best sense of that phrase. She is chef at "Le Maison Pic" and "Le 7." "Le Maison Pic" was founded by Anne-Sophie Pic's grandfather, Andre Pic, in 1936. (And Andre's mother had previously run a restaurant there as far back as 1891!) Andre grew-up watching his mother cook local specialties. He apprenticed under some of France's top chefs, came home and took over the business. In 1934, "Le Maison Pic" was awarded 3 Michelin stars. Thrilled with his new status, in 1936 Andre moved the restaurant to its present locale in the heart of Valence. During Word War II, the restaurant lost it's 3rd Michelin star. But when Andre's son Jacques took over, the restaurant regained the coveted 3rd star in 1973. Jacques and his wife Suzanne (Anne-Sophie's parents) brought the restaurant to international acclaim. Over the years, the 3rd star was again lost in 1995 and after over ten years as Chef, Anne-Sophie reclaimed the 3rd star in 2007. She is the 4th female chef in France to achieve 3 Michelin stars. You can imagine the drama in those stars! In 2011 at age 41, she was named Best Female Chef of the year by S. Pellegrino. Chef Anne-Sophie is a self-taught chef with a very good pedigree. She did not study the culinary arts in college - she studied business and indeed began her work life in the world of business. Eventually she returned to the fold and began cooking. While staying true to her father's vision, she has her own inherent sense of combining ingredients. This tomato chutney recipe is an excellent example. Just look at the ingredients - all full-flavored but they do not compete. They combine to layer flavors - so that the sweetness of the honey and tomatoes begin your tasting journey but you are treated to a pit of pungency, a little sour and a brief hint of hot before you finish a bite. Cut an X in bottom of each tomato with a sharp paring knife and blanch tomatoes together in a 6- to 8-quart pot of boiling water, 10 seconds. Transfer tomatoes to a bowl of ice water to cool. Peel off skin with paring knife, beginning from scored end, and discard. Coarsely chop tomatoes. Cook sugar in a dry 2-quart heavy saucepan over moderate heat, undisturbed, until it begins to melt. Continue to cook, stirring, until sugar melts into a golden caramel. Remove from heat and carefully add vinegars. Stir in remaining ingredients and simmer, uncovered, stirring occasionally, until thickened, about 1 1/2 hours. Discard star anise. Chef Anne-Sophie Pic serves this chutney with a skewer of rabbit liver and kidney. I - won't. I will be slathering this on sandwiches and serving it as an accompaniment to pork. But having spoon-fed myself quite a bit of this chutney - I think it would a be a welcome accompaniment to chicken, steak and fish. It embraces all. Don't eat meat? Mix it in with rice or use it as a topping for crostini. It is an equal-opportunity small dish. Please check out what the other bloggers are doing for Week 28 of Female Chef Gourmet Game Changers. And if you want to join in the fun, e-mail Mary at One Perfect Bite. Mary started this delectable journey. We are taking a holiday break and will resume the posts after the New Year. It was in an apartment development in Fresh Meadows (Queens) called Meadowlark Gardens, New York City where I began this love affair. It was a one-bedroom apartment. The living room held a black and white TV console complete with rabbit ears. There was a sleep sofa against a long wall (where I was sure a skinny werewolf could hide) and the room was shaped into an "L". The "L" section had the quintessential 1950's formica table where we gathered for dinner every evening. I loved the speckled pattern in the formica and would stare at those speckles (especially if broccoli was being served) until the patterns twinkled back at me and the table morphed into the sky and I was one with the formica. (Zen-formica, anyone?) It was at that table where I fell in love with vinegar. My mother had a wooden, sturdy salad bowl and served salad at least 4 nights a week. (Thank-you, Mom). I remain a salad fiend because of her and that well-seasoned wooden bowl. She would dress the salad with oil and vinegar just before dinner. My mother, the wooden bowl and the vinegar magically transformed lettuce into food fit for gods.The sounds of her tossing lettuce leaves was my cue to wait while she returned to the kitchen so I could start sneaking lettuce leaves out of the bowl and into my mouth. After dinner, I would drink the remains of the oil and vinegar dressing. Most satisfying. It wasn't until I was 17 on a date at a fancy-schmancy steakhouse that I learned there were other salad dressings. I didn't even know salad dressings came in a bottle! I had flirtations with blue cheese dressing, then Russian and even a brief crush on Green Goddess (the link brings you to Cinnamon Spice's version) - but in the end, I always returned to oil and vinegar. And oil and vinegar always forgave me. I still don't mind taking a spoon (I've come a long way) and having the last of the sour-puckering fermented liquid. But that's probably too much information. It's no wonder I took to this Insalata di Rinforzo (Reinforcement Salad). It's so named because it is constantly being "reinforced" with added vegetables, or extra dressing to stretch it to last for the week. The salad is fortified with 1/4 cup white wine vinegar. (My heart thumps just typing this.) 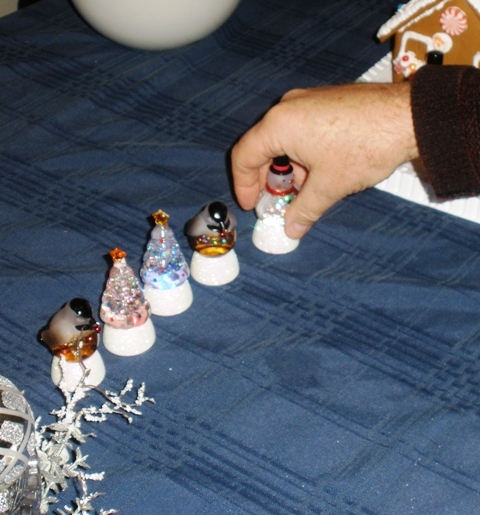 And really - couldn't we all use some reinforcements during December? 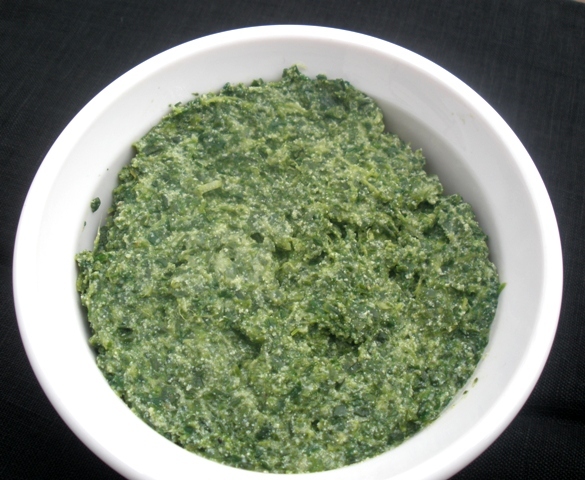 The recipe hails from Campania and is true comfort - from vegetables! Cut the cauliflower into bite-size florets, discard tough stalk. Bring a medium-large pot of water to boil and. add the cauliflower florets and some salt and cook until just tender - 6-7 minutes. Drain and place under cold water to stop the cooking. In a large bowl combine the cauliflower, celery, carrots, red pepper, capers and parsley. You can add the olive oil and vinegar right into the bowl or whisk them first in a small bowl. Cover and refrigerate one hour or overnight. The salad just gets better and better. Bring to room temperature before serving. Play with the salad as the Italians do. Think it needs an anchovy or two? Add it. Want to try broccoli? Why not? The beautify of the salad is because it uses solid, firm vegetables - it does not wilt - it just tastes better every day. It's perfect for a buffet - it never gets soggy. And it's winter pretty - glistening white with speckles of color. And it has heft - not every salad can say they have that. I know there's a lot of tasty butter, sugar and eggs floating around blogosphere these days. A salad break can't hurt! While I wish I could offer you all my formica-zen moments, I understand that not everyone bonds easily with speckles. In its place, find the Drifters below singing "White Christmas." It's winter magic. I have a crush on the tenor-reindeer (don't tell Paul or Vinegar). Play this every time you need a break - I guarantee you'll smile. Spiced pears? Almond-vanilla cookies? Yes, please. I'm nesting - prepping the home for family. This happens every winter when the days are shorter than the eves. I gaze at my home and think "This doesn't work" and then I move everything around. Saturday I changed everything in my kitchen cabinets. Confusing my family who now cannot find the cereal but are grateful I left the coffee in the same place. These hail from Piedmont - a large northern province in Italy that actually does see winter. The baking of the pears in a spiced-sugared wine showcases the creamy, sweet "meat" of the fruit. Perfect after a heavy meal. More perfect in the deep, dark days of December - the perfect month to rejoice in cloves, cinnamon and ginger. They bring comfort and joy to the table. Preheat oven to 450 degrees F (230 degrees C). In a baking dish large enough for the pears but small enough to have them fit all snugly and upright, place your pears. In a small mixing bowl, stir the wine, sugar and cloves. Pour over pears. Bake the pears 45-60 minutes, occasionally basting the pears with the liquid. The pears are done when tender - just pierce one with a fork and see how easily it glides. Cool to room temperature before serving. In the words of my daughter, "Boom! Done!" How easy was that? Think of these as once-baked biscotti. These are easy, melt-in-your-mouth sliced cookies that celebrate vanilla and and almonds. Just a tad crunchy on the outside, and tender-melty inside. They hail from my grandmother's region of Basilicata and are reminiscent of Italian wedding cookies. Cream the butter and slowly add the sugar - beating well. Add the almonds and vanilla and mix. Add the eggs - one at a time - beating well after each addition. Similarly - add the flour 1/4 cup at a time and and mix each thoroughly before adding the next 1/4 cup. To bake: Preheat oven to 350 degrees F. Grease 1-2 cookie sheets. Slice refrigerated dough into 1/4 inch slices (you can slice thinner - just adjust baking time). Place 1 inch apart on cookie sheet. Bake about 15 minutes - just until the edges start to brown - you want tender, white cookies. Through these cookies I have grown as a person. I have learned to practice acceptance. Because of these cookies - I can reach into my innermost soul and state - that in the ways of the world in December - I will not be taking off my extra Italy weight anytime soon! A raw carrot does not have the same song as an Italian cookie. Yesterday, my daughter actually accused me of adding Pippin (her cat) to the end of my blog posts as a cheap gimmick to solicit comments! I won't even dignify that accusation with an answer. Anne Willan has been off my radar. As a cookbook author of more than a dozen internationally acclaimed cookbooks that include From My Chateau Kitchen, Cooking with Wine, and the 17-volume, step-by-step, illustrated Look and Cook. For a more detailed listing as well as a blurb on the books, please click here. The pure romanticism in the title From My Chateau Kitchen makes me want to know more. "An authoritative yet intimate appreciation of both the food and the culture of Burgundy. Interwoven in the text, which presents colorful characters from the depth of rural France are some 300 photographs and 160 recipes from Anne's personal repertoire." You know I want to know the colorful characters. Don't you? Yes, I'd like to know more. She recently moved to L.A. from her 17-bedroom, 17th century chateau in Burgundy. Quite a life change but Ms. Willan has had many life changes. A daughter from an upper class British famly, she graduated from Cambridge with a Master's Degree in Economics (circa 1959). A chance class at Cordon Bleu in London proved to be a game-changer. She simply fell in love with cooking and although her family disapproved - she pursued it. She went to Paris to pursue her culinary studies and once graduated she put out an ad in the Herald Tribune: "Cordon Bleu cook will give lessons and and cook for dinner parties." There were only six replies but one reply led her to cook at Versaille. The tale is here and it's a good one. Ms. Willan is the real deal. She may hail from Yorkshire but she has been showered with honors and awards from every corner of France as well as in the USA. This is the holiday season and you are likely busy, so I won't list them here - but take a peek if you have a monent - it's inspiring - http://www.lavarenne.com/about.htm. She may be a French Chef but this recipe is pure Italian. It sings of Parmesan. It's savory, peppery and you really want a nice glass of Prosecco -or at the very least some fine sparkling water to accompany this. The cheese-pepper bites just begged for sparkle. And this is the season of sparkle, isn't it? I found it on The Wednesday Chef and you can read Luisa's description of these savory cheese bites here. Or just make them. Because in the season of sweets, a little savory is most appreciated. 3. Heat the oven to 350 degrees. Bake the cheese balls until lightly browned, 25-30 minutes - check after 25 minutes) They keep well in an airtight container, or they can be frozen. I got 24 Parmesan balls out of this recipe..
And yes, 'tis the season of sparkle and sweet. But don't forget savory and sophisticated. Add a little French flair to your table and check out what the other bloggers are doing for Week 27 of Gourmet Game Changers. And if you want to join in the fun, e-mail Mary at One Perfect Bite. Mary started this delectable journey. And after intermission - it snowed. Yes, only 3 inches. And yes, heavy, wet, greasy snow - the sort of snow that is stunning to look at - it coats all in a white-furred embrace and shimmers in the dusk. The sort of snow that gives a woman who has "driver's anxiety" even when not driving, even in the summer - pause. A friend - Mark Paulson - Lynn's talented husband and /colleague/artist/all-around kind and fascinating person was driving. I do plan well around my anxieties! We had parked in a lot and when figuring out the payment for the day, the parking lot yelled at us to "stop loitering." Twice. Now, I grew up in New York City and a parking lot has never spoken to me - much less admonished me - twice. So, the day began with amusement - "the parking lot voice." And got better - with a show that charmed. And then I got into my friend's Miata for the slippery drive home. If you know anything about Miatas - you know they are four inches off the ground. Three inches of snow expected. Four inches. Hmmm. Worrisome for someone with car/snow-phobia. Yes, we got home. Yes, Mark told me amusing stories (hitching a ride in Glacier park and getting in a truck with some armed-drunk-people and their 90 year-old mother who smoked all his cigarettes and came on to him when he was - all of nineteen). And more. Telling a playwright stories during an anxiety-ridden drive is ingenuous. My friend knows how to calm. Once home, I thought about this. But decided butter, sugar and chocolate was better and did this. These cookies hail from - where else - Verona. And come Christmas, the bakeries in Verona are filled with them. But you don't have to celebrate Christmas to know that these tender, soft-crisp sandwich cookies laced with chocolate in the middle are meant to please - all. 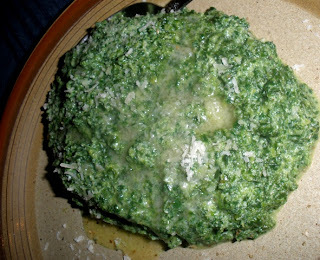 The recipe is from the Williams-Sonoma book Savoring Italy written by Michele Scicolone. In a large bowl using an electric mixer, beat 1 cup of butter, confectioner's sugar and salt until light and fluffy. Then, beat in the rum (or extract). Stir in the flour 1/4 cup at a time and beat till well-blended. Cover and chill until firm. -about one hour. Tear off 1 teaspoon of the dough at a time and form into a small ball. Place the balls about 1 inch (2.5 cm) apart on baking sheet. Bake until firm - about 12 minutes (mine took 14 minutes - you want them to crisp - so a bit firm but not browned. And they will crisp as they cool. Taste to see - tasting is the fun part.) Transfer to wire racks to cool. Place the chocolate and remaining 2 tablespoons of butter in the top of a double boiler. (You can try the microwave - if you are really good about not burning). When water in the bottom is simmering (and not touching the top), stir the chocolate and butter together until they combine. Remove top from boiler and set aside to cool a bit (until it is spreadable - 5-10 minutes). Spread a small amount of chocolate on bottom of cookie (I put a small puddle in the center and that worked). Place a cookie top on top - pressing it a bit to ooze the chocolate - until it is a sandwich and place it on the wire rack to set. Let cool on the wire rack (10-15 minutes). Can store in an airtight container for a week (or in the fridge as I am doing!). Juliet would be pleased. So would Romeo. And so was family. They encouraged me to continue baking to cure car-anxiety! And so our oven is on, the heat is on, the Christmas lights are on and still there is a chill in the living room. Oh! Pip-a-doo knows where all the vents are. I am thrilled and humbled to announce that Under a Midsummer Moon has been selected as one of two plays to receive a grant by Playwrights in Our Schools to be developed in the winter of 2012. And where will it be developed? Park City, Utah. I skiied there. Before snow-phoia sent in. It snows a lot. Every day in fact. You have to smile.